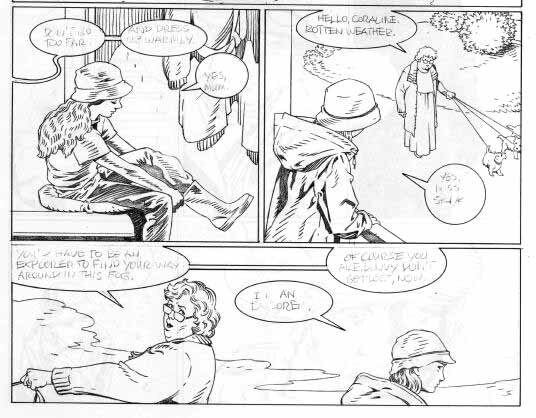 The placing of balloons and captions on a page of comics art is an area that many people seem to find difficult. Here is a guide to placement I put together some years ago, and incorporated into my book, which I hope you'll find helpful. First of all, this is not rocket science! If you use what you already know about reading, and some common sense, you'll be fine. Second, it's a lot harder than you might think to make a page truly confusing, but it's wise not to slow the reader down. They might just skip the whole story and not come back. In English we read across from left to right, skip down, then left to right again. This happens inside a balloon, inside a panel, and across a whole page. Most readers will scan an entire page first to look at the art, read any large display copy or sound effects, then settle down to reading the words. So, if your page has a visual surprise, it's best to put it at the top. Looking at your script, number each item to be lettered with a colored marker. On original art, place balloons with an erasable light blue pencil. On a photocopy of the art, you can place the balloons with a marker. Try to size your indications by the amount of words going in each spot. This gets easier with experience. Number your placements to match the script. Ideally, balloons and captions shouldn't cover figures. When they must, try not to cover hands and feet, and never cover faces of important characters. Generally balloons look best above and away from the speaker. Jamming balloons in a narrow space between figures is not a good idea. Be careful with overlapping: keep it consistent. Balloons usually shouldn't go behind one part of a figure and in front of another. Nor should they go in front of a foreground figure while going behind a background figure. When copy (the words) won't fit in the panel it's intended for, consider if you might A) move some to the panel before or after, B) overlap an adjoining panel without confusing the reader or C) edit the copy! Within a panel it's always best if the character on the left speaks first. Otherwise you force the lettering to take up more space, as shown in the examples below left. 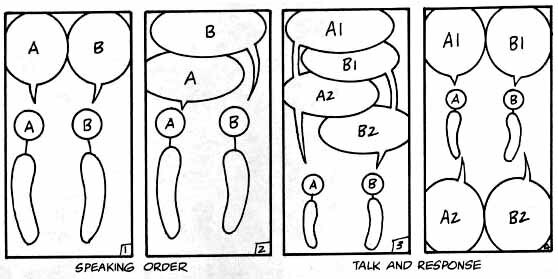 Talk and response in one panel requires extra space, too. When possible, consider making examples like those shown at right above into two panels each. The layouts below are the least likely to create reading problems: horizontal rows of panels (grid format), one vertical row, and one horizontal row. It's still wise to try to have the balloons and captions move from top left to bottom right whenever you can, especially with vertical panels. When vertical and horizontal rows are mixed, or when angled, round, or oddly-shaped panels are added, extra care must be taken to keep the reader on track, especially when the direction you want them to go moves against common reading practice. The best way to do this is to lead the reader across the page and across panels with an implied trail of balloons, as shown here. Keep balloons that should read down close together, or overlapped. Use large open arrows between panels if you must to force reading order (an old ploy not often seen today, but still effective in extreme circumstances). Here are the same pages as above with a purposely confusing layout. As you can see, they could still be figured out, except for balloons 7 and 8 in the first page, but many readers would probably be confused. When faced with a challenge, ask yourself, "Does it really matter which of these balloons is read first?" Sometimes it doesn't. When all else fails, consider FLOPPING a panel (flipping the art so the left side becomes the right side, and vice versa) to reverse speaking order, or have some of the art redrawn or the script rewritten. Try to avoid crossing balloon tails, which looks rather silly. Remember that there are often several ways of solving any placement problem, and try to work through them for the best answer.